On the northwestern shore of Chebeague, accessed via North Road across from the historic cemetery and church. The property is accessed by a 50-foot wide right of way held by CCLT that runs from North Road across private property. 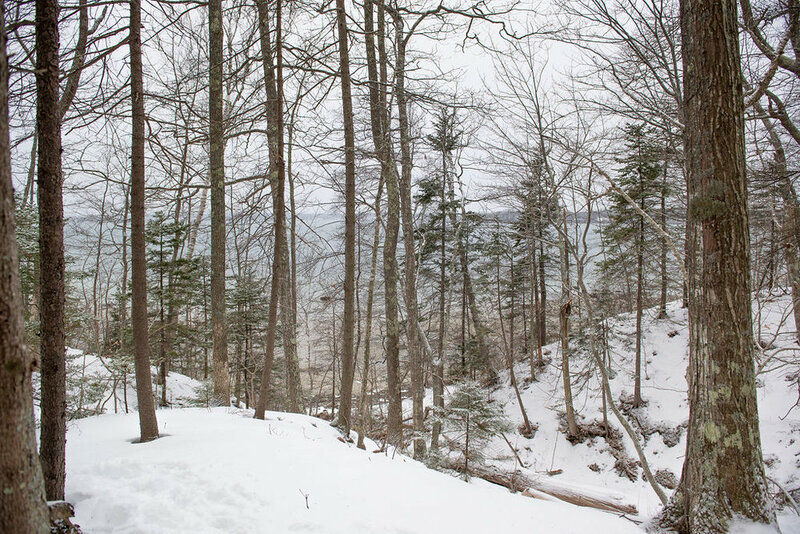 In 2018, a walking path was cleared along this right of way to the town-owned land, ending in a loop that parallels the ravine and shore, affording tree-framed views out over the bay. To preserve and protect the property in perpetuity as an undeveloped natural and scenic resource for traditional low-impact outdoor recreation, education, nature observation and study by the general public; to preserve the health of the forest, shoreland, riparian habitats, and coastal shoreline ecosystem; and to guarantee the public’s access and enjoyment of the property. The Curit property was part of an original 118-acre homestead settled by Ambrose and Deborah Hamilton in 1761, and later one of 10 parcels granted to the Hamilton children in an 1819 subdivision. Changing hands over the years, this 14.5-acre parcel was purchased by Barton and Marjorie Curit in 1969, and subsequently acquired by the town of Cumberland in 2004. CCLT purchased a conservation easement on the western 8.2 acres, which included nearly 575 feet of shoreline. The property was transferred to the town of Chebeague Island when it seceded from Cumberland in 2007. The conserved land is rolling and thickly wooded, with a ravine carving its way across the property and emptying its spring-fed perennial stream into Casco Bay over a small waterfall. The shoreline is characterized by high banks and a rock and sand beach, with scenic views up and down Casco Bay and across to the mainland and Cousins and Littlejohn Islands. The property is covered by an uneven-aged, mixed species hardwood and softwood forest. Tree species include white pine, red oak, balsam fir, red spruce, red maple, American beech, paper birch, and white ash. Understory shrubs and plants include Jack-in-the-pulpit, sarsaparilla, witch hazel, various types of ferns, and the invasive species Japanese barberry and Oriental bittersweet. White-tailed deer, wild turkeys, and red squirrels can often be seen in the woods. Bald eagles and Ospreys roost in and hunt from the tops of the shore line trees. There are productive clam flats along the shore.